What makes a yoga retreat successful comes down to a number of things. When they are set in beautiful surroundings, with relaxed scenery but most importantly when the teacher is fully prepared and switched on to his or her location and the possibilities for students there. We all want a relaxed retreat to study and learn yoga from and if you are a teacher looking to run a yoga retreat, here are 5 top tips to ensure you not only make money, but also that you have a fantastic and fulfilling time doing so. Make your yoga retreat unforgettable! Putting together a yoga retreat successful to you and your students depends on how well you’ve planned the retreat and how far in advance you have done so. The worst thing you can do when planning your retreat is to jump into it head first. Take time to research a number of different options in terms of location. It is exciting to think you can go anywhere in the world but if you choose to take your Yoga students to a location you are not familiar with, the stresses and strains of that unfamiliarity will come across to your students. The more relaxed you are as an individual, the more this will transmit to your students. Luxury isn’t always important, and as long as accommodation is clean and well run the majority of your students will be happy. Older, more affluent clients might prefer a hotel that is more luxurious and this could be something you look at depending on the type of clientele you are looking to register. Research the local area fully. Is it close to the airport and/or amenities? Does it have a good reputation for cuisine in the local area and what level of food service will you expect from the hotel? Getting to know the manager of the hotel can be life saving in the case of an emergency so look to make contacts quickly. Many retreats are happy to have you stay in advance for free or relatively cheap if you are open about looking to book with them for a full group stay in the near future so always look into this as a possibility. Go and have fun there so you know your students will! Don’t get too excited when choosing the location of your yoga retreat, successful as it may be to have it in a far-flung and exotic place, such as India or Mexico. Your student’s happiness stems from the flow of energy between you. If you are happy and comfortable this will transfer to your students and lead to a calm environment where they can learn. By planning and not treating the retreat like your own personal holiday, you can stay focussed on what matters, your students. There are plenty of beautiful locations in Europe, none more so than our very own retreats in Andalucia, Spain where you can find peace and tranquillity on the sand and by the sea. A successful yoga retreat will be one that has created long lasting bonds and friendship between students and teacher. From the very beginning ensure you are there for all of your students, from check in until they check out at the end of their stay. You are there to guide them socially for their holiday, as well as be there for them spiritually and for the yoga sessions themselves. Keep the conversations flowing and they are more likely to respond to the way you teach and be more honest with their feedback come the end of their stay. Be genuine, relax and have fun with your students and they will too. A great way to create a memorable yoga retreat successful in all aspects is to think about sessions with another teacher, keeping things fresh and interesting. 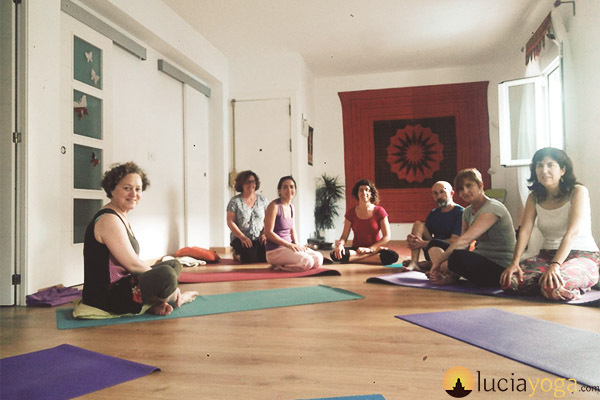 We understand that at Lucia Yoga through the strength of our team! Don’t be too proud, especially if this is the first time you’ve taken a group of students to a yoga resort. A yoga retreat is successful long-term if the person running it understands how to take on board constructive criticism and how to evolve as a human being, not just as a yoga teacher. The most successful yoga retreats in the world won’t have always been perfect; it would have taken time to tweak the sessions by taking on board the feedback from students. A yoga retreat, successful or not, is only as good as its teacher. You are at the heart of everything and your students will sense it if you’re not comfortable with your location, or accommodation or you’ve not planned sessions well enough in advance. Lucia Yoga offers you the first dawn light to your body and mind in some of the most beautiful locations for yoga retreats anywhere in the Western world. Take advantage and come to see what we have to offer you and your students as you plan your next yoga retreat. We welcome you to join us. …and don’t forget to put aside a budget for marketing. With so many retreats out there, unless you have strong following….some kind of financial or/and time needs to be invested into this. Yes, you are right Sanctuary Healing Retreat, at LuciaYoga we offer an “early bird” promotion, and as well a promotion for the “earliest bird”, if you book before 5 months the yoga retreat starts.Thank you for your coment.